The Japanese word “Zen” derives from the Sanskrit term “dhyana”, which refers to non-dualistic, meditative absorption. Zazen, or silent Zen meditation, is the essential practice of Zen. By helping to free the mind of all thoughts and images, this practice allows our innate wisdom and compassion —our own “buddha-nature”—to come up to consciousness, so that we can awaken to it and actually live the wholeness and perfection that is our birthright. The truth to which Zen points lies far beyond words and concepts; although the teachings of Buddhism are vast and deep, it is actual Dharma practice that brings about transformation. Zen practice challenges our most cherished assumptions and leads to direct experience of our own inherent freedom. 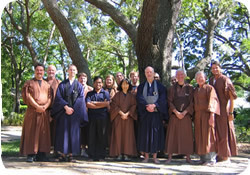 Located in Clearwater, Florida, our sangha was founded in the 1980's by Ken Rosen. Our teacher, Sensei Lawson Sachter studied Zen Buddhism for many years under Roshi Philip Kapleau at the Rochester Zen Center. He and his wife Sunya Kjolhede, both Dharma heirs of Roshi Kapleau, co-direct Windhorse Zen Community, located near Asheville, North Carolina. Lawson visits and conducts meditation retreats at the Center in Clearwater several times a year. The Clear Water Zen Center is open Sunday at 9:30 AM, for three 35-minute rounds of zazen meditation with a short period of walking meditation (kinhin) between each sitting. Please arrive at least a few minutes early, as we begin promptly at 9:30 AM. See our schedule for Sunday, Monday, Wednesday, Friday and Saturday meditation, workshops, retreats and other events. 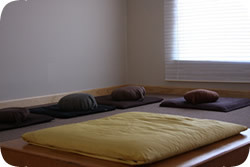 The zendo, or meditation room, is furnished with sitting cushions and chairs. Clothing should be comfortable, modest, and plain. Everyone is welcome to stay after meditation for tea and an informal Sangha gathering.